I must confess despite sharing the same birth land I have never completed a J.R.R. Tolkien novel. For years The Silmarillion and The Hobbit sat on my bookshelf less than half read with Smaug occasionally staring at me from atop his pile of gold. So you see my expertise, and expectations of the cinematic adaptations of Tolkien's books are limited to Ralph Bakshi's 1976 The Lord of the Rings, Peter Jackson's marvellous Lord of The Rings trilogy and the book cover below - and let me tell you Peter Jackson's The Hobbit: The Desolation of Smaug is considerably more exciting, as he brings Benedict Cumberbatch's Smaug to life so gloriously. I am in no way denigrating Tolkien's literary works or indeed, relevance in the cultural fabric that makes up our social Zeitgeist – “go on a quest” and “slaying the dragon” have become synonymous tropes for rites of passage that proliferated much of the fiction I was immersed in as a youth, both are lifted from Tolkien's books – yet I wouldn't swap one sun soaked second of my childhood to have full knowledge of the insides of Tolkien's books as wonderful as I'm sure they are. In the time between starting to write this and picking up again today I have seen The Hobbit: The Desolation of Smaug a second time and have had some time to think about Peter Jackson's adaptations of Tolkien's works - and I have to say I am in awe of the wonderful world Peter Jackson and his team have brought to the screen. If you think about it and cast aside all the peripheral stuff, whether you love or hate his adaptations they are truly momentous achievements each bringing to life a rich and imaginative world for us to behold and The Hobbit: The Desolation of Smaug is one of the highlights for me. I would be hard pressed to think of anyone else who could have brought Tolkien's Middle Earth to the screen so adroitly. You can find more about The Hobbit: The Desolation of Smaug on Facebook or on Twitter. The Hobbit: The Desolation of Smaug opens in flashback, well it actually opens on an extreme close-up of Peter Jackson in his boldest and cheekiest cameo so far, letting us know that The Hobbit: The Desolation of Smaug is well and truly a Peter Jackson joint and I have to say it certainly feels like one. I love Jackson's earlier films, the small low budget films he made pre The Frighteners, don't get me wrong all his films are carefully constructed and wonderfully entertaining but his earlier works are where you will find his most ingenious efforts. But with great budgets comes great responsibility and Jackson's film are a little less edgy and little less screw ball. But there are moments in Desolation that harken to that time and the magic of his vision as the film is realised on screen. One of these moments is an incredible scene involving a Dwarf, a barrel and some Orcs. It was absolutely glorious and I was in awe whilst howling with laughter at the same time – that is the magic of Peter Jackson's work - he can take the most fantastical thing, give it an extreme zing and make it even more entertaining. Anyway, the flashback takes us back, no even further back than events in The Hobbit: An Unexpected Journey and we see the genesis of the quest undertaken by the Dwarf Prince Thorin Oakenshield (Richard Armitage) to reclaim his rightful place as King of the Kingdom under the Mountain and create a home for Dwarves everywhere , as well as the role Gandalf The Grey (Ian McKellen) plays in its inception. Before throwing us headlong into where we left off with The Hobbit: An Unexpected Journey - Beorn's Carrock, after just having just escaped the Orc's cliff top attack. We continue the quest with Thorin and his small but big hearted band as they traverse Middle-Earth from The Shire in Hobbiton to The Lonely Mountain, Erebor. Encountering all sorts of fantastic and marvellously realised creatures and obstacles along the way. A definite highlight of The Hobbit: The Desolation of Smaug for me are the Orcs. They are mind blowingly well made especially especially Manu Bennett's Azog. I couldn't tell if they were prosthetic-ally made up, computer generated or a mixture of the two - either way they look and move like real creatures, they are extraordinary and should surely be recognised by the people who recognise this sort of thing for awards. However the same cannot be said for the return of Orlando Bloom's Elf Prince Legolas. For some reason in the early scenes that he features he has this odd glow effect on his face - which I assume is to let us know that he was much younger than in the events featured in The Lord of The Rings Trilogy - but instead he looks like a badly airbrushed tabloid profile photo. Fortunately this does not extend to the entirety of Bloom's performance who seems much more at ease with his character, in fact this is the best Legolas we have seen yet. He is given some back story and this added depth makes him seem less contrived and more purposeful. In fact one of the strengths of DOS is that there are many engaging characters that unfortunately put Martin Freeman's Hobbit in the shade, although I suspect this all part of the theme of Hobbits going about unnoticed if they choose and heroes finding themselves. DOS is very much Thorin (Richard Armitage), Kili (Aidan Turner), Tauriel (Evangeline Lilly) and Bard (Luke Evans) show and not even scene stealing performances from Stephen Fry and Benedict Cumberbatch can wrestle the film from them. Thinking about Cumberbatch - it has to be said I was a little disappointed with Benedict Cumberbatch's Smaug – just to clarify Smaug is awesome (as are the Giant Spiders) and there is nothing wrong with Cumberbatch's, as always superb delivery. Indeed I never thought I would be so taken with a talking dragon! But there is nothing inherently Cumberbatch about Smaug – anyone could be voicing him. And a more distinctive voice could have been chosen. I'm just saying. In fact the Dwarf or Orc (I forget which) that sounded like he was voiced by Ray Winstone, and Graham McTavish's Dwarf Dwalin who looks and acts uncannily like a diminutive Middle-Earth version of Tom Cruise's Les Grossman were almost as memorable to me. But this doesn't detract from the long awaited and spectacular confrontation between Smaug and our heroes, albeit too short. In terms of longer story arc, Jackson seems to have jumped to form and we are following a very similar arc to the Lord of The Rings Trilogy. The first film was a little slow as it introduces the world, characters & personalities and lays the foundation mood for further films to be built on. True to form as with The Lord of the Rings: The Two Towers the pace is little faster, obstacles and danger are more present and the tension strings are tighter. But a noticeable difference is that The Desolation of Smaug feels smaller in scope and more personable. It feels like there are a broader set of characters to care about rather than lots of stuff happening all over the place stretching your attention. Thorin (Richard Armitage) gets more screen time and we begin to understand him a little better for better or worse, Dwarf Kili (Aidan Turner) develops feelings for the fiercely independent Elf Tauriel (Evangeline Lilly) - and who can blame him? She is some kind of wonderful - and Luke Evans as Bard shines. I would have loved to have seen him as Julian in Nicolas Winding Refn's Only God Forgives, we'll never know how it would have played with his inclusion – but no doubt he would have brought some of the intelligence and charisma that he exhibits in Desolation and the great little chiller No One Lives released earlier this year. You can't fault Peter Jackson's film making he is one of the modern day greats and whilst the narrative steam of some of his projects seem to occasionally lose their impetus (King Kong, The Lovely Bones) navigating the treacherous path between fan expectation and telling beloved stories in a fresh and exciting way. The Hobbit: The Desolation of Smaug charges head first with its swords firmly raised in thrill mode. That is apart from Gandalf's segway into the mystery of who is behind all the odd events and Orcs gathering at every corner. On its own it would be great but when juxtaposed with the rest of the film it is a little jarring switching between the two disparate narrative speeds. 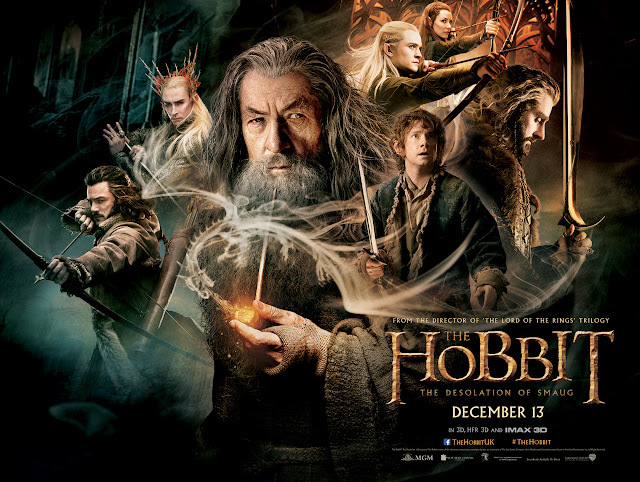 All in all The Hobbit: The Desolation of Smaug is a magical experience and I loved it! 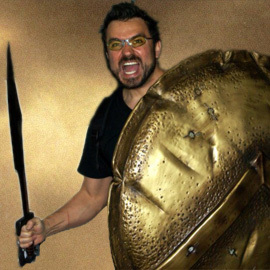 The only downside to it, is that we are now one film closer to the end of Peter Jackson's adventures in Middle-Earth.